Oklahoma Boomers takes you back to the year 1889. 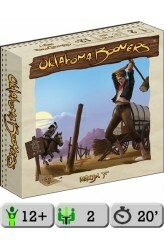 The Land Run of Oklahoma has just taken place, and now you and your opponent strive to get your Boomers the largest homesteads — but that can be harder than it looks! Each player has three Boomers. On a turn, a player moves one Boomer in a straight line on the game board grid, moving it as many spaces as they wish. After this, he may use this Boomer and one of the opponent's Boomers to place cornerstones on the game board; these cornerstones are placed on the intersections where these two Boomers would meet, should they move toward one another. (If one of the Boomers couldn't reach an intersection point due to another piece being in the way, that cornerstone is not placed.) Chains of cornerstones form b..